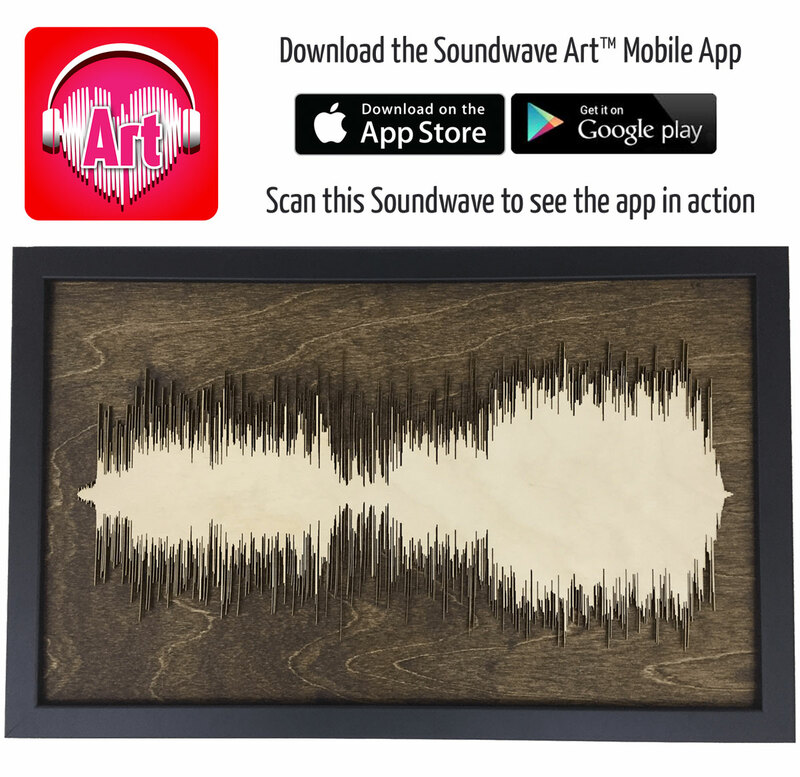 Layered Wood Soundwave Art & Mobile App Giveaway Winner: Congratulations to Richard S. of Albuquerque, NM, winner of the Layered Wood Soundwave Art & Mobile App. Thanks to all entrants, and be sure to check the Dude homepage or Dude Giveaways section for your chance to enter our latest prize drawing. This giveaway concluded on October 8, 2017. Audio goes visual goes audio-visual. 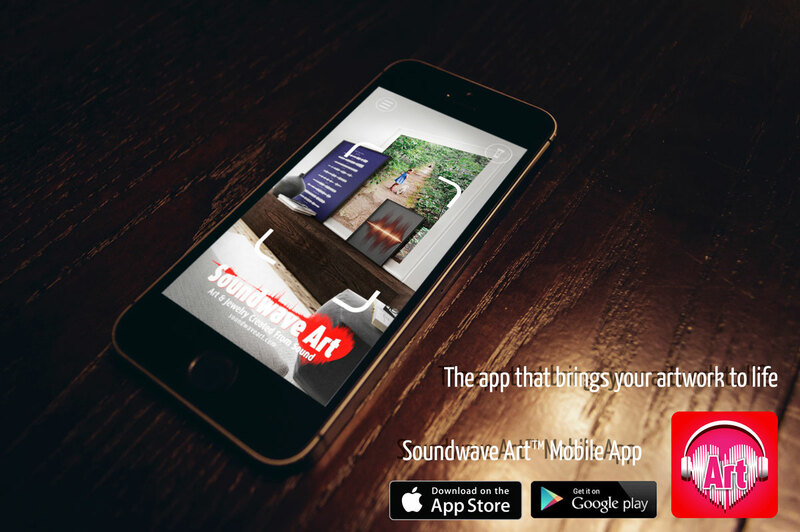 Soundwave Art converts recorded messages into artwork, and their new mobile app lets you scan the art to hear, or see a video of the message. 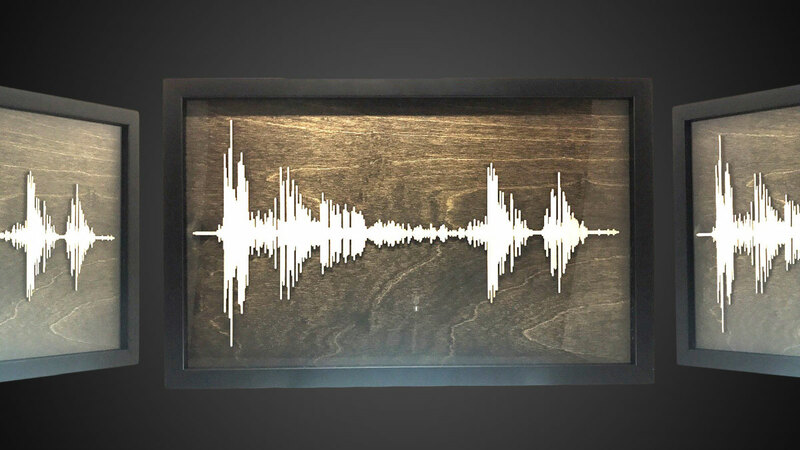 Click here and enter to win a layered wood Soundwave Art piece, custom cut with a personal voice message, plus Soundwave's Media package and Soundwave Art app. A $340 value from Soundwave Art! Record a message you want a loved one (or yourself) to remember -professions of passion, wedding vows, words of encouragement, a baby's heartbeat, "Tacos are mankind's greatest culinary invention" - and Soundwave Art will extract the unique sound waves your voice generates and engrave them on a layered birch cutout from their collection. Recordings are made directly from the company's purchase pages. And now that Soundwave Art has mastered visualizing your audio, they've turned to making their pieces even more dynamic and interactive. The new Soundwave Art app allows those who own a Soundwave to scan their artwork with a mobile device, and hear the message captured in the waves in the real voice (or bark, or meow) of the messenger. Or, alternatively, messengers can choose to link a video to their Soundwave, so a scan will pull up their face and actions along with their voice. The layered wood design sees your voice message cut out of birch wood, and then framed in an Italian wood moulding with a glass front. Here's a 360-view. Paired with the included Soundwave Media package and the free Soundwave Art app for Apple and Android, the art's owner will be able to scan the wood cutout and hear a recording - video or audio - of the message embedded in the design. Or, if you prefer, video / audio of something else altogether. Soundwave Art uses augmented reality to overlay a video right on top of art pieces, and can also turn regular photos into art that will work with the app. Videos can be up to 3 minutes in length, with a max size of 200 MB. To register, click here and fill out the Layered Wood Soundwave Art & Mobile App Giveaway entry form. Or, if you're already a member of DudeIWantThat.com, when the magic entry form button appears, just click it to enter. 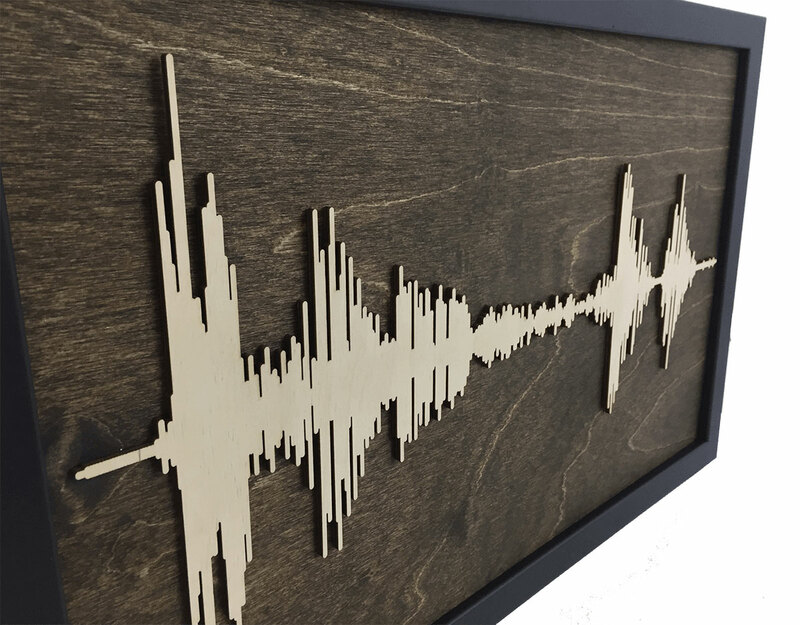 Giveaway prize includes: 1 x Solid Wood Soundwave Art framed layered wood cutout ($319.99) and 1 x Soundwave Media package ($19.99). The accompanying Soundwave Art app is free. 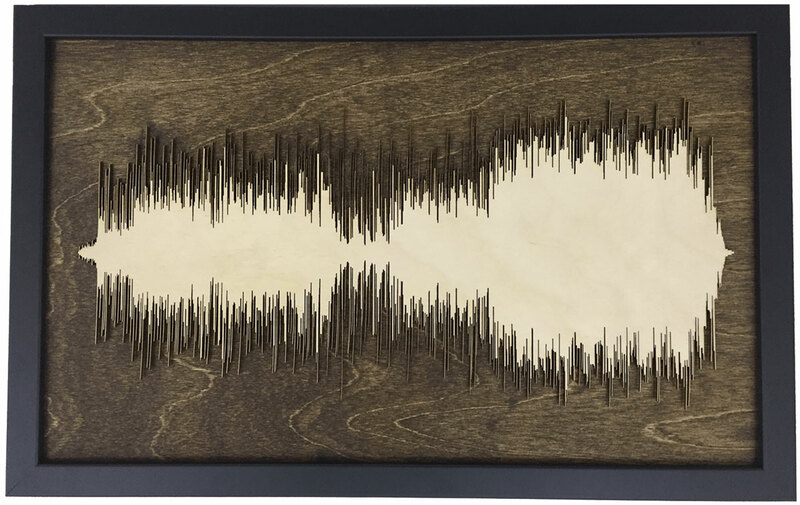 The Layered Wood Soundwave Art & Mobile App Giveaway entry period is open through 11:59 p.m. ET on Sunday, October 8, 2017. Our drawn winner will be contacted by email within 48 hours of the entry period's conclusion, and will have 12 hours to respond and claim his/her prize. (Should we not hear back from a drawn winner in the specified time period, a new winner will be drawn and contacted.) Winners should allow 3 weeks for art fabrication, plus delivery time. Once a winner is drawn and confirmed, s/he will be announced below. The perfect gift is just a click away. Peruse Soundwave Art's full collection of engraved voice artwork and jewelry here, plus learn more about the Soundwave Art app here.